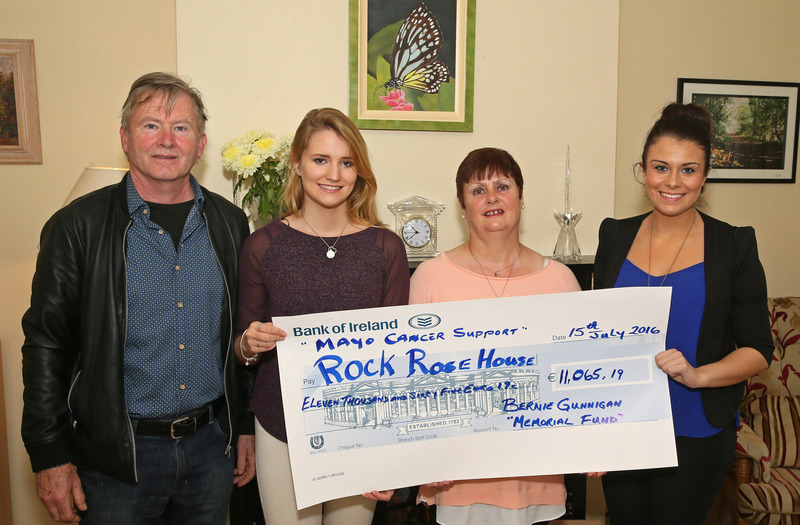 Pat Gunnigan, Lisa Gunnigan, and Clare Hyland presenting cheque to Tricia Greavy, General manager Rock Rose House, Castlebar proceeds of fundraising from Ladies Mini Marathon for the Bernie Gunnigan Memorial Fund. Thank you to all who took part in the Women’s Mini-Marathon, provided sponsorship, gave donations, prizes for the raffle or who helped out in anyway. A Special Word of thanks to Claire Hyland and all of Bernie’s family for their hard work in raising a substantial figure of €11,065.19 for Mayo Cancer Support, Rock Rose House which provides for the needs of people living with Cancer, their families and friends. All our services including therapies and counselling are provided free of charge thanks to the generosity and goodwill of the public. We greatly appreciate all of your wonderful support to our association.